Hometown: this should be a short answer question but it never is for me! I grew up in Kenya – a small town called Malindi, though now my family is all in Nairobi. That is home, but England has also always felt like home as I grew up partially (on and off) here! Training background: I trained at a school called Purusha Yoga in San Francisco, where we studied in the Raja Yoga tradition – focused on Hatha, stemming into versions like Vinyasa, Yin, Restorative. Studying at Purusha was amazing as Joy Ravelli, the head instructor and owner of the studio, has been training teachers for more than 20 years, and the breadth of her experience, and that of the other teachers there, gave us a really in-depth well-rounded view on teaching, anatomy and the history and philosophy of yoga – enough to know that we were only scratching the surface and there is always so much more to learn! What is your favourite yoga pose and why: Downward dog. Well there are a few... but I'm going to stick with downward dog. I love it. It is essential. It is place where you don't have a reason to forget any part of the body – in it I can be aware of all things, and the connection between all things, and simultaneously it is a place of great surrender. I can feel the ground. I can feel my spine's length. It is hard work and then also shifts into almost feeling restorative at times. In those moments it feels like home. The place to return to and feel like everything is right in the world. What is your least favourite yoga pose and why: Hmmm, well I'd say that I actually kind of love my least favourite poses! 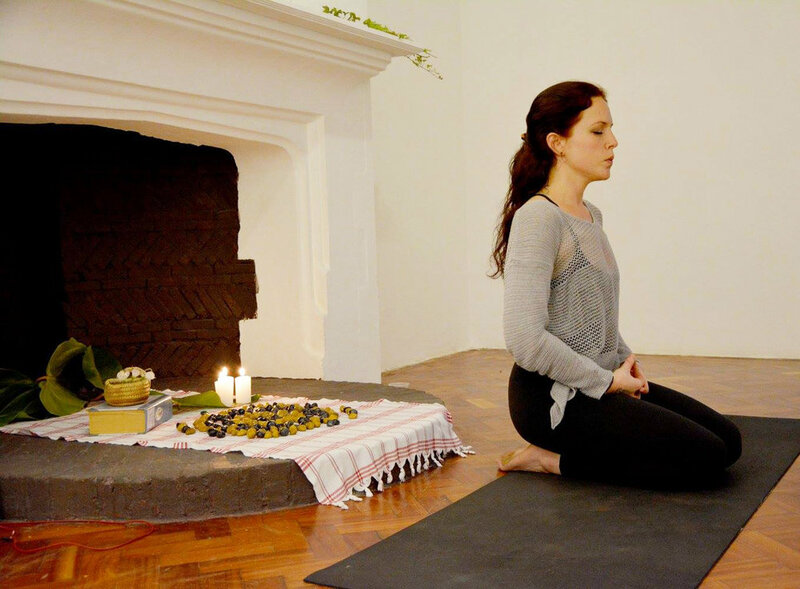 For example, gomukhasana – cow face pose – is so very uncomfortable in my body, but it offers me the special practice of finding ease in a place of difficulty... and afterwards I always feel better for it. It's also part of becoming more self-aware, and noticing the things you really need (sometimes not what you're naturally drawn to). It's not about feeling good right now, but about the health and benefits (and perhaps good feelings in those) that come over time. What is one of your mantras? Something like "Let what comes, come." I think often , in some form, about releasing the hold on things and the idea of control. And letting what is going to be, be. We do what we can, but we cannot control everything. It's about being decisive and also flexible – committed, but fluid. Being here with what is right now. Do you have a go-to practice to get you through busy or challenging times? Music. In any form. I sing, so singing really helps me. But listening to music, being surrounded and engulfed by it, and singing – besides yoga, that has helped me through the most difficult moments and feelings. I could sit and do that for hours in times of sadness. I put the music on and am driven by it in times of busyness. With the right music on, I feel like I can do anything. And tea. And long showers. I find that anything that is a "pause," or that helps to slow down time, helps you in the long run because you realise that everything that needs to get done will, and everything else won't matter. What can students expect from your yoga classes? In yoga, I found the ability to clear the space, to not feel surrounded, to release – I strive to channel this experience to others. To me yoga is like a dance; it is an expressive bodily language, and in it we move and search for the "sweet spots". My practice and my classes exist around this opportunity for clarity and expression – they are focused, challenging but accessible to all, but above all they are fun and inclusive. You will hear a lot of music – mostly unexpected! – and you will be provided with a place where you can come as you are (intentional Nirvana reference...). I believe in hard work and creating heat (tapas) where it counts and has purpose, but balancing this with softness and ease. Where did you last go on holiday? Did you take your mat? My last holiday was in December and was actually my honeymoon! It was in Malta, was barely planned and was a beautiful, unexpected surprise of a place. I admit I did not take my mat as I was specifically there to have a break from EVERYTHING – we walked, ate, explored, and slept 10 hours every night! My practice in that period was to fully restore, and I'd say it was a massive success! Something we may not know about you… Well, there are so many things... I am a big Trekkie. A Star Trek fan. Very big. I love stories in general, fantasy and science fiction above all. And I do not watch TV. But Star Trek is something I will always watch. Next Generation is my number 1. But is followed very closely by the Original Series and DS9. And yes, I have related many, many things from Star Trek to yoga ...and used them in classes. Monday nights 20.00 at Mitcham's Corner. Click here to book. Find out more about Ali on her website here.